With this ease of use add-in for MS Excel you will be able to redesign the look and feel of your charts and reports in Excel, giving them a new fresh, personal and professional look. Access to 5 new color palettes for your reports and other 12 for charts, customize and save your own color palettes with the colors of your business/customers. Export selections of your Excel file as pictures to be used in presentations, reports, publications or web pages. 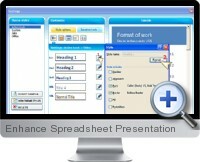 also you could save many images in your worksheet and use them for future use. Draw ovals and put sticky notes, add watermarks, stamps, highlights, arrows and more around the cells easily. Clarify or intensify the color of the cell backgrounds, zoom to fit your selection with the screen, display or hide grid lines. Customize, if you like, the tools according your needs and requirements to save time.